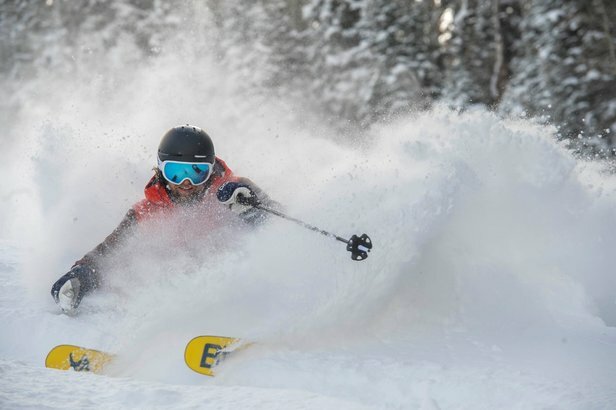 Tomer's Take: Ski Banff or Schweitzer on Friday, Tahoe or Mammoth on Saturday, and Sun Valley, Jackson Hole, Grand Targhee, or Tahoe on Sunday. Bonus, on Monday ski Utah's Wasatch Front. 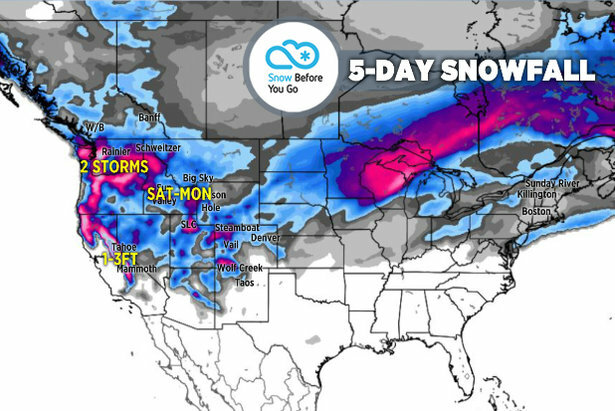 The active pattern across the West continues over the next five days with two additional storm systems lined up. The jet stream will move both through California and the Pacific Northwest. In the Northeast, a large, warm storm systems moves through with rain/snow on Friday then colder air sweeps in. We're still on El Niño watch. Official forecasts continue to call for a 65 percent chance of a full-blown El Niño before the end of winter. But sea surface temperatures in the South Pacific have cooled since December 2018. Nonetheless, the transition from La Niña last winter to pseudo El Niño this winter has created momentum in the atmosphere. As a result, the storm track has shifted further south across the West. I expect that pattern to continue for the remainder of February and March. Two more storm systems are lined up. The first storm arrives on Friday afternoon with moderate snow accumulations into Saturday, and the second storm is right on its heels on Saturday-Sunday with heavy snow accumulation. Light snow could linger into Monday morning. 1-3 foot grand totals by Monday at Tahoe to Mammoth. Two storm systems are lined up. The first storm arrives on Friday continuing into Saturday with heavy snow accumulation at the Cascades and Volcanoes. The second storm arrives late Sunday continuing into Monday with moderate to heavy accumulation. Snow tapers off on Thursday, then drier. Great skiing in Utah and Colorado on Thursday. Look to Alta, Snowbird, Aspen/Snowmass, Crested Butte, Vail, Telluride and Wolf Creek on Thursday. A band of light snow races through on Saturday in Utah and Saturday night in Colorado, then drier. An actual storm system arrives in Utah on Sunday evening and Monday morning in Colorado. Moderate to heavy snow accumulation. Excellent skiing Monday-Tuesday at most resorts. Light snow ends quickly on Thursday morning then drier. An actual storm system arrives in Idaho and Montana on Friday then Wyoming on Saturday. It continues on Sunday and possibly Monday. Another storm system is possible on Tuesday. Heavy snow accumulation. Look to Jackson Hole and Grand Targhee on Thursday. 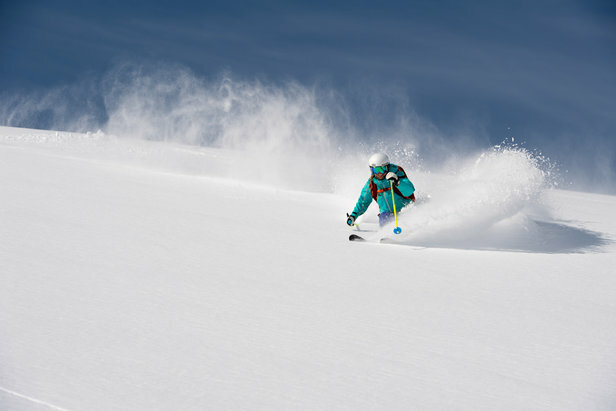 Look to Schweitzer and Whitefish on Friday and Saturday. Look to Sun Valley, Jackson Hole and Grand Targhee on Sunday. A rain/snow mix arrives Thursday night changing to rain and then back to snow by Friday afternoon/night. Colder with leftover snow showers and lake effect snow on Saturday. Drier on Sunday. Chance of light snow on Monday, and a larger storm system possible Tuesday-Wednesday. 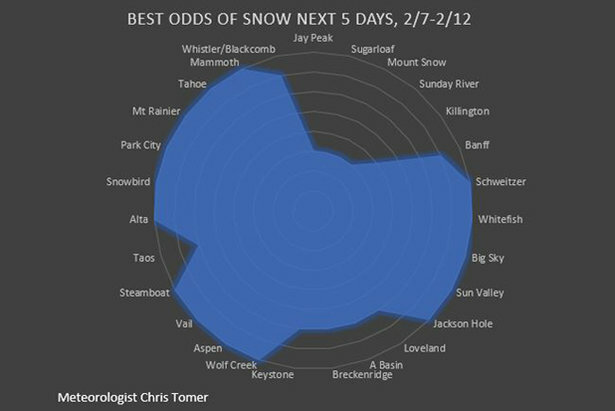 Best odds for snow February 7-12, 2019. The primary storm track is a little too far south over the next five days. That means the heaviest snow misses the area to the south. Light snow rolls through on Thursday and Friday. Another shot of light snow arrives on Monday. The primary storm track is a little too far south over the next five days. Light snow rolls through on Thursday and Friday. Another shot of light snow arrives on Monday.